Foamer pumps create foam without the use of gas propellants. Their unique technology allow for the precise mixing of liquid and air, resulting in a dose of high quality foam with each single stroke. 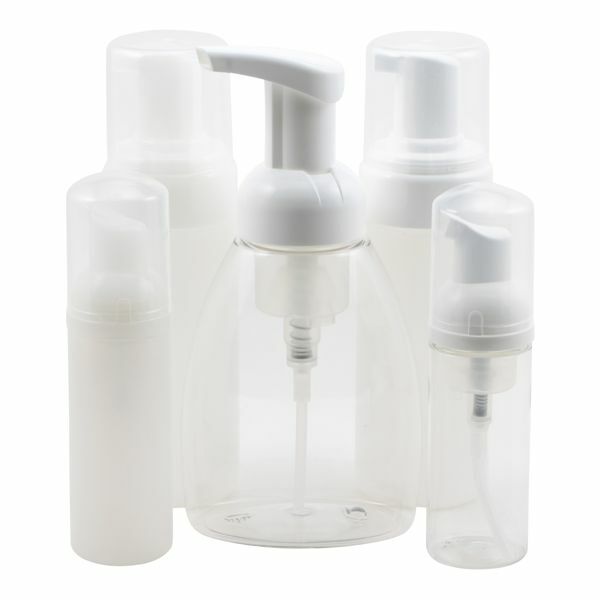 These foamer pumps are great for cosmetic and personal care products such as facial cleaners, soaps, body washes, hand sanitizers, and many other products that can be diluted in water. Our 50ml bottle in a natural HDPE or clear PET is a convenient size for sales promotions, on shelf testers, and for personal use while outside the home. Larger sizes a include 125ml white or natural pump with a straight sided natural base and a bell styled 250ml with a clear base and white pump. These foamer bottles are BPA free.